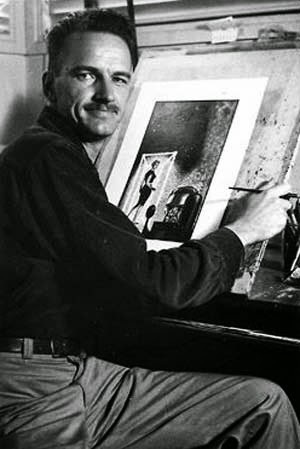 Edmund Alexander Emshwiller was born February 16, 1925 in Lansing, Michigan. His father was Errol Emshwiller, born 1896 in Indiana. His mother was Susie MacLellan, born 1895 in Michigan. His parents were married in 1923. He was firstborn of their two children. His little brother Mac Lellan Emshwiller was born in 1928. His father was a veteran of WWI and a teacher at a local college, the Ferris Institute. They lived at 409 Marion Street in Big Rapids City, Michigan. By 1940 his family had moved to Richmond, Virginia, where his father had been hired to work at the U. S. Patent Office. They lived at 1510 Laburnum Avenue. He attended high school and on June 25, 1943, when his Junior semester was over, he enlisted for military service in WWII. His occupation was listed as motion picture projectionist. After the war he attended college and graduated in 1948. He went to Paris in 1949 and studied for one year at the Ecole des Beaux Arts. He created a few covers for pulp magazines, but he mostly did interior story illustrations for Planet Stories, Future Science Fiction, Thrilling Wonder, Starling Stories, and Amazing Stories. He created many more interior story illustrations and covers for digest magazines such as Galaxy, Fantastic Story, Mercury Mystery Book, Astounding Science-Fiction, Fantasy and Science Fiction, and Space Stories. He married Carol Fries on August 30, 1949. They raised a daughter, Susan, and a son, Peter. In the 1950s and 1960s "Emsh" also created hundreds of covers for paperbacks and hardback books, for such publishers as Gold Medal Books and Ballantine Books. He also made story illustrations for men's adventure magazines, such as Sportsman and True Action. In the 1960s and 1970s Ed Emshwiller worked extensively with 16mm experimental underground films, and was an active member in the independent film movement in California. He was the Dean of the School of Film at the California Institute of Arts, in Valencia, CA, from 1979 to 1990. Ed Emshwiller died of cancer at age 65 on July 27, 1990.